January 16, 2019, Morristown, NJ – Atlantic Health System’s Morristown Medical Center today announced it has been redesignated as a Magnet® hospital for the fifth consecutive time by the American Nurses Credentialing Center (ANCC). The ANCC’s Magnet Recognition Program® honors healthcare organizations for quality patient care, nursing excellence and innovations in professional nursing practice. Only 13 out of 482 Magnet-designated hospitals have been accredited five times. 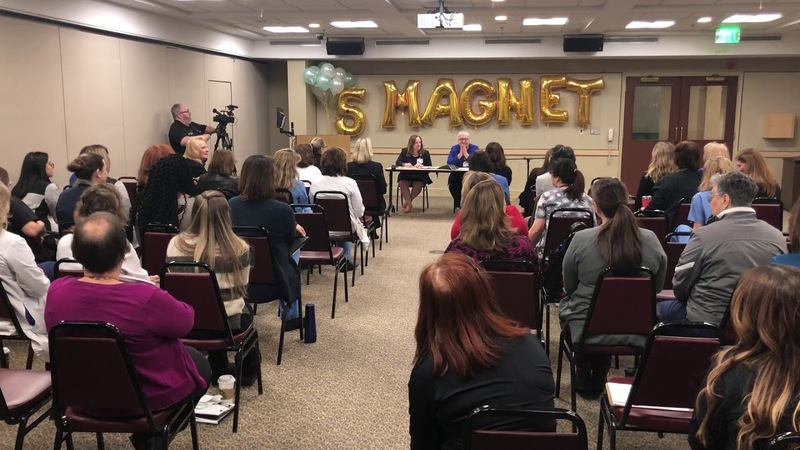 Jeanette Ives Erickson, DNP, RN, NEA-BC, FAAN, Chair of the Commission for the Magnet Recognition Program, shared the news with over 100 of Morristown Medical Center’s 1,800 nurses on Wednesday morning. “As the President of Morristown Medical Center, and as a nurse, I am extremely proud of Morristown Medical Center and our commitment to excellent patient care, improvement in care delivery, focus on education and research, strong partnership with our medical staff and communities, and continued opportunities for nurse empowerment and innovation,” said Trish O’Keefe, PhD, RN, president of Morristown Medical Center and nurse at the medical center for over 30 years. To achieve Magnet recognition, organizations must pass a rigorous and lengthy process that requires widespread participation from leadership and staff. Magnet redesignation is based on several factors including staff empowerment, shared decision making, professional development, nurse recruitment/retention, and a higher standard of practice. A robust Shared Governance model for nurse empowerment that gives decision-making responsibility to the bedside nurse, which fosters accountability, promotes collaborative care, and results in more effective and efficient patient care. A nursing empowerment model that fosters a culture of nursing excellence that encourages and rewards nurses who go beyond existing performance standards. A professional practice model with patients and families at the center, driving all aspects of nursing care. In 2018, the nursing administration at Morristown Medical Center created a Center for Nursing Innovation and Research—a designated space for nurses to design and conduct nursing research to improve patient outcomes, explore evidence-based practice, and create innovations for nurses within Atlantic Health System and across the nation. Continued and higher education opportunities are plentiful and encouraged. “Adaptation and innovation have been part of our nursing culture for years and the goal now is to prepare our nursing practice for the future of nursing excellence,” said Jones. The Magnet Recognition Program® administered by the American Nurses Credentialing Center (ANCC), the largest and most prominent nurses credentialing organization in the world, recognizes healthcare organizations that provide the very best in nursing care and professionalism in nursing practice. The Magnet Recognition Program serves as the gold standard for nursing excellence and provides consumers with the ultimate benchmark for measuring quality of care. The Magnet Recognition Program designates organizations worldwide where nursing leaders successfully align their nursing strategic goals to improve the organization’s patient outcomes. The Magnet Recognition Program provides a roadmap to nursing excellence, which benefits the whole of an organization.